Naomi O’Reilly Come Closer (taste it) 2016. Video. 1920 x 1080 pxl. 13min 57sec looped. Naomi O’Reilly Come Closer (touch it) 2016. Video. 1920 x 1080 pxl. 10min 40sec looped. Manning + O’Reilly Artists is the collaborative practice of visual artists and curators Aishla Manning and Naomi O’Reilly. Initiated in 2015 the duos first project was the laundrie national emerging art prize, a parody art prize that utilised collaboration to combat and critiqued the competitive undercurrents instilled in artists though institutionalised art competitions. Their name followed in the style of parody and mimicked the major sponsors of the art prize. The duo created Balloon Animals for Boxcopy’s exhibition HOMEGROUND: Brisbane Artist Run Activity, Today and Tomorrow. HOMEGROUND was an accumulative exhibition project, with six artist run initiatives in residence at Boxcopy for one week in succession. The exhibition emphasised collaborative and speculative methods of working. Ballon Animals combines Manning’s playful use of commonplace objects and materials that carry a sense of familiarity and banality with O’Reilly’s macro photography that engages audiences in intimate and prolonged observations of a subject through forced perspective. Together they explore themes of failure, humour, absurdity and intimacy in a recontextualised, sensory experience of the everyday. Ballon Animals combines Manning’s use of familiar and banal objects that are animated through subversive play with O’Reilly’s macro photography that engages audiences in intimate and prolonged observations of a subject through forced perspective. Together they explore themes of failure, humour, absurdity and intimacy in a recontextualised, sensory experience of the everyday. Come Closer 2015. High definition digital video with sound. 1920 x 1080 pxl [14:03 looped]. Come Closer 2015. High definition digital video with sound. 1920 x 1080 pxl [14:03 looped]. Installation at The Interdisciplinary Studio, QCA Galleries, Griffith University, Brisbane, Australia. Images courtesy of the artist. 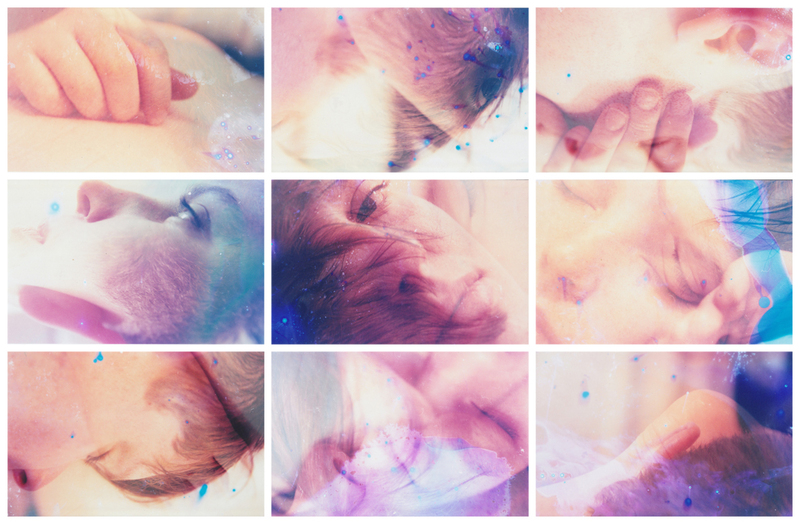 Flesh: Fragmentation 2015. High Definition Digital Video. 1920 x 1080 pxl [9:42 looped]. Flesh: Fractured 2015. Tiles, acrylic paint, pva and human hair. 72cm x 52cm. 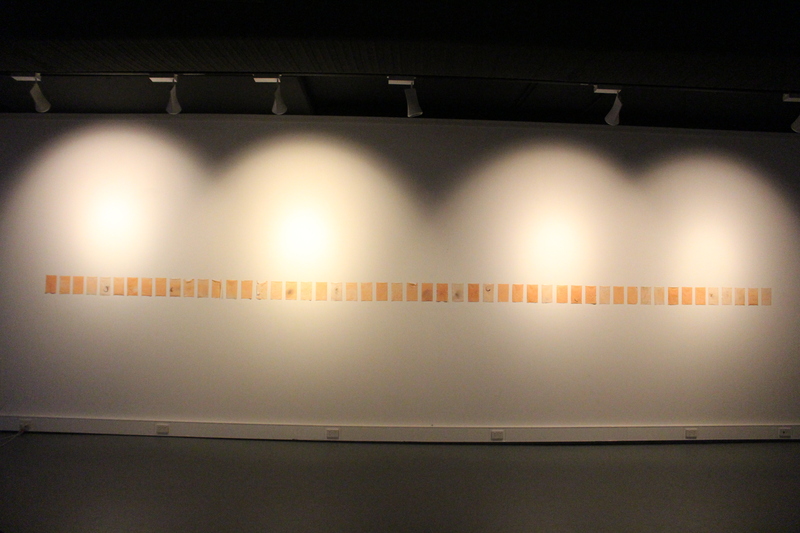 Installation atThe Webb Gallery, QCA Galleries, Griffith University, Brisbane, Australia. Image courtesy of the artist. Sensation 2015. High Definition Digital Video. 1920 x 1080 pxl [1:25 looped]. Installation at The Laundry Artspace, Brisbane, Australia. Single Channel High Definition Digital Video. 1920 x 1080 pxl [1:32] Installation dimensions vary. Amalgamation: Disintegration 2014 (Still). Digital Installation Mock-Up. 3 Channel High Definition Layered Digital Video. 1920 x 1080 pxl [6:07 looped]. Installation dimensions vary. Image courtesy of the artist. Amalgamation: Disintegration 2014. Installation Queensland College of Art, Brisbane, Australia. 3 Channel High Definition Layered Digital Video with Sound. 1920 x 1080 pxl [6:07 looped]. Installation dimensions vary. Amalgamation: Disintegration deals with ideas of personal identity experienced though intimacy. A three-channel projected video installation piece of high definition imagery that encompasses the viewer in an overwhelmingly saturated grid of breathing, beating, pulsating and jittering body parts. 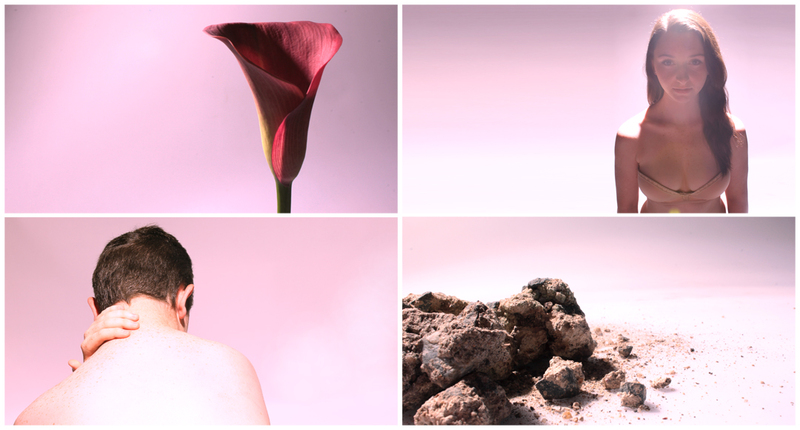 Influenced by the artistic collaboration of Marina Abramović and Ulay. Amalgamation: Disintegration features a female and male subject. The installation of this work engages with ideas of the gaze, challenging the tradition of the female gazed upon subject. 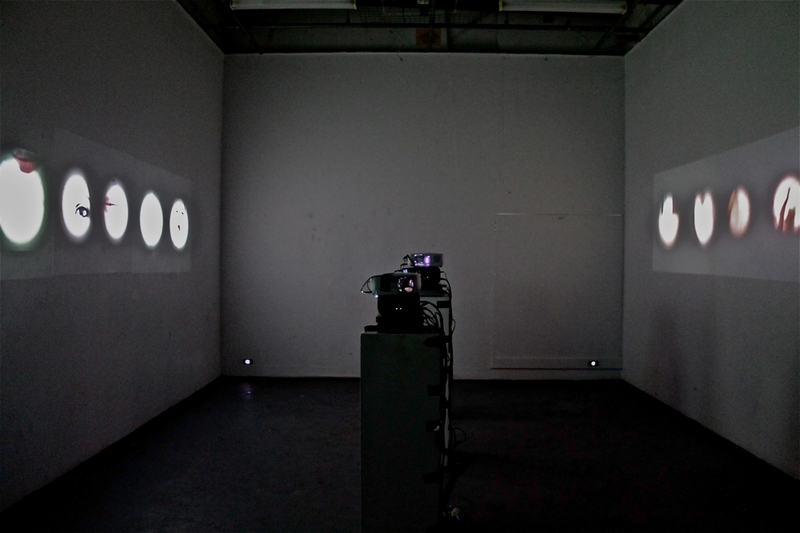 Within the main projections, the two subjects are positioned to observe each other. The audience member intersects this intimate gaze though their observation of the work. The central panel features the male and female subject integrating into one. The layered videos unite in a corporal and carnal inferred interaction. Layered over the subjects are internal shots of the human body, sourced from surgical footage and national geographic documentaries. The abstract biological and medical imagery creates a dissonance between sensual figurative forms. A soundtrack of guttural sounds connecting the tangible physical form to the delicate internal accompanies the projections and further engulfs the viewer. As the sound speeds and slows the viewer is moved between states of calm and heightened – almost anxious – tensions. Intramural 2014. Collaboration with Alison McKay. High Definition layered digital video triptych. 1920 x 1080 pxl [7:05 looped]. 72.7cm x 18.6cm. Image courtesy of the artist. 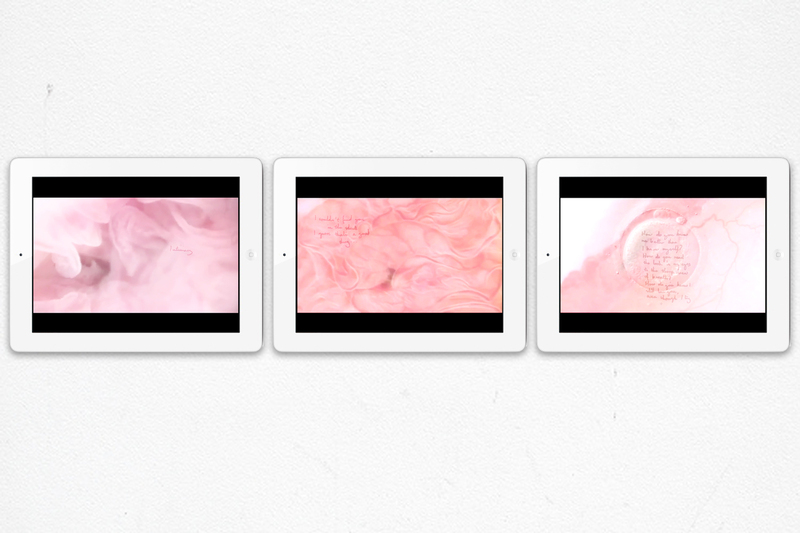 Intermural is a video triptych that explores a feminine experience of intimacy from a personal position. Personal narratives written by Alison McKay are layered over abstracted internal footage of the virginal canal, cervix and uterus. An emotional exposure is accompanied by a physical exposure. The imagery presents itself in a submissive nature. The work is delicate in its approach of the grotesque internal. The private is made public as this work penetrates the subject’s emotional state and physical form. Fragility:Fleshly 2013. Installation detail Queensland College of Art, Brisbane, Australia. 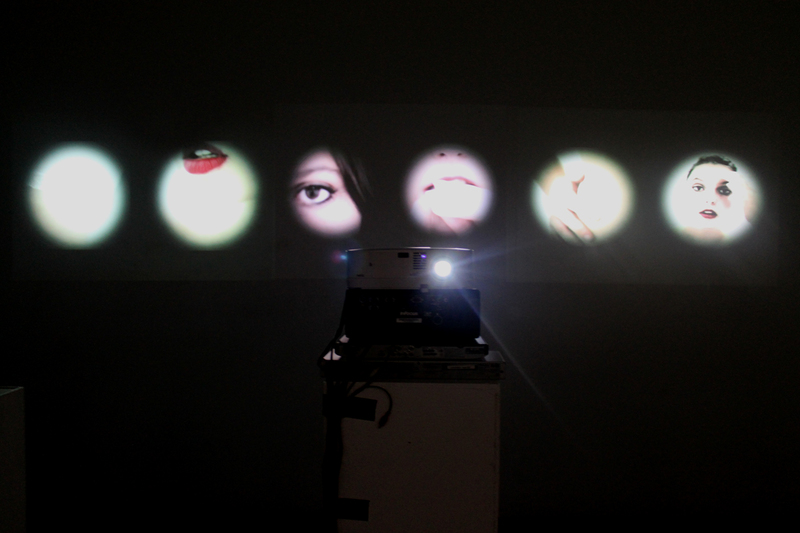 High Definition digital video projected through hanging sheets of PVA glue, Acrylic paint and Human hair. Fragility:Fleshly explores the limitations and impermanence of the physical body. While the fleshly form of the human body allows the conscious to function in a physical world, it is a delicate and impermanent form. The constantly aging body imposes physical limitations on the limitless conscious, which brings into question wether it is a vehicle that enables, or a prison that contains. 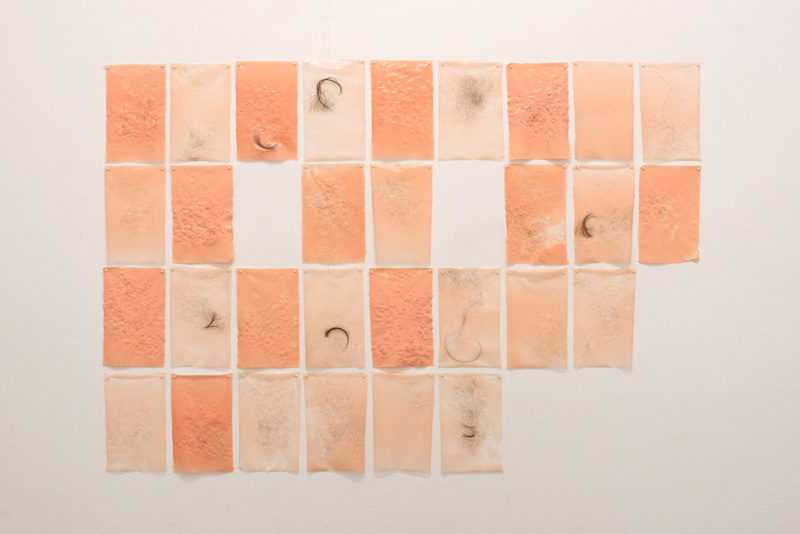 Inspired by the work of predominant female artists such as Ann Hamilton, Eva Hesse, Pat Brassington, Emiko Kasahara and Julie Rapp, Fragility:Fleshly reflects upon trends in female art. Employing domestic elements such as pegs and wool it presents an ascetic that plays on contrasts, balancing between comfort and distress, intrigue and repulsion. The fragile skin forms each hold unique qualities but produced on mass, are lost in repetition. This mass production and reputation is mirrored in the grid structure of the video work. Played on loop the work is constantly changing, while endlessly trapped in repetition. Amalgamate 2013. Giclee Print on Epson Photo Paper Premium Gloss. Series of Thirty 29.7cm x 21cm. [Installed 183.2cm x 109cm] Ed of 3. Fleshly 2013. Giclee Print on Epson Photo Paper Premium Gloss. 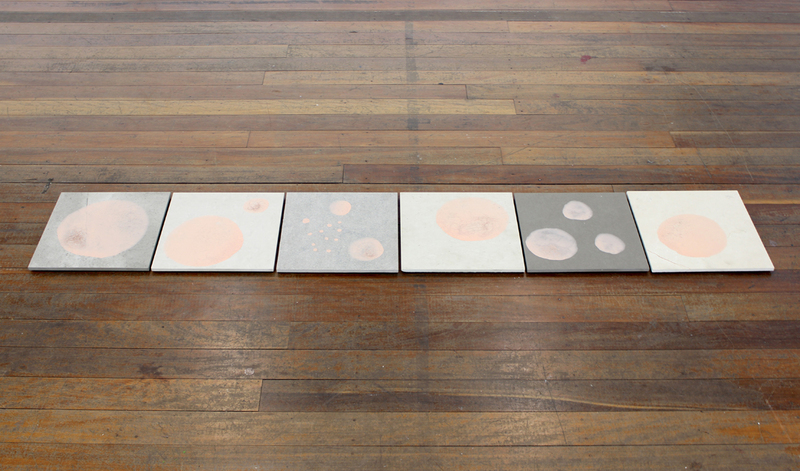 Series of Thirty 15.24cm x 10.16cm. [Installed 93.44cm x 51.6cm] Ed of 3. Landscape 2013. Giclee Print on Epson Photo Paper Premium Gloss. Series of six 32cm x 21cm. [Installed 194cm x 21cm] Ed of 3. Landscape (Black and White) 2013. Giclee Print on Epson Photo Paper Premium Gloss. 194cm x 32.39cm. Ed of 3. The Other 2013. 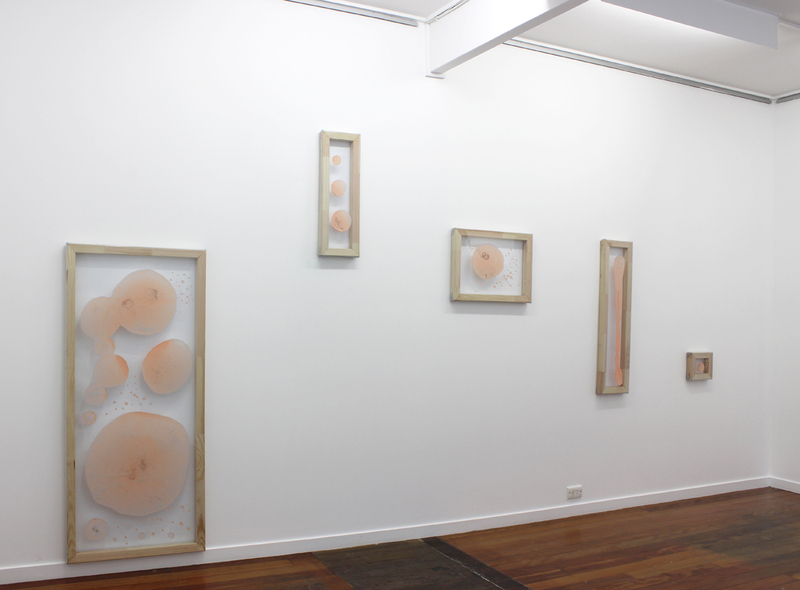 Installation view Queensland College of Art, Brisbane, Australia. High definition digital video installation on projectors, iPads and iPhones. The Other 2013. Installation details Queensland College of Art, Brisbane, Australia. High definition digital video installation on projectors, iPads and iPhones. The Other deals with ideas of personal identity experienced though intimacy. Referencing the artistic collaboration of Marina Abramović and Ulay. The Other features a female and male subject. The installation of the work experiments with ideas of the gaze, challenging the tradition of the female gazed upon subject of Renaissance painting. Similar to the work of Ann Hamilton the circular vignettes and peephole crops reference the sensual physicality of observation. In reference to the work of Australian artist Tracy Moffatt, The Other juxtaposes fantasy and reality through altered film to create a hyper real ascetic in reference to classic cinema. Within the main projections, the two subjects are positioned to observe each other. The audience member interrupts this intimate gaze though there observation of the work. 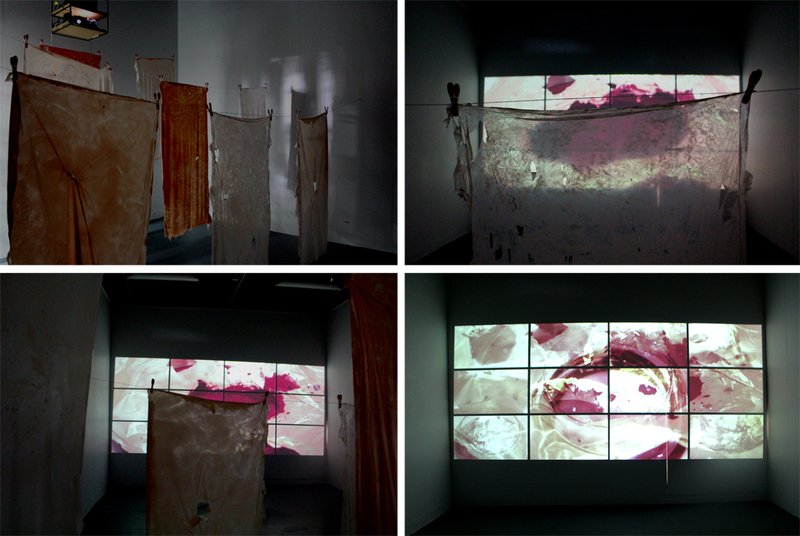 The smaller screens positioned close to the ground force the viewer to lie next to the subject in order to observe them, establishing an intimate moment between viewer and viewed. 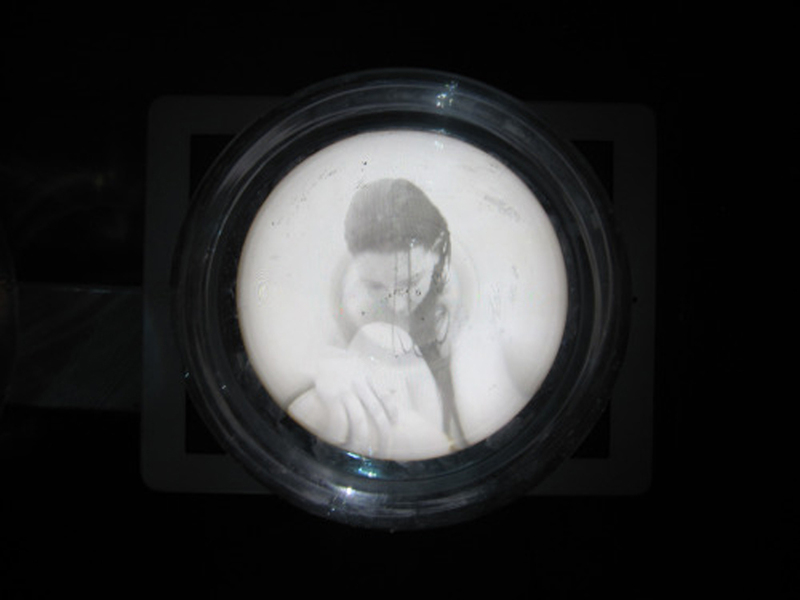 Within the dark room installation the audience member views the gazed upon subject through a peephole from a position of heightened empowerment, observing a vulnerable private moment. As the subject looks back at the observer, they become aware of the gaze. Through the observation of the other, the viewer becomes aware of the self. Fragility: Femininity 2012. Installation Still Queensland College of Art, Brisbane, Australia. 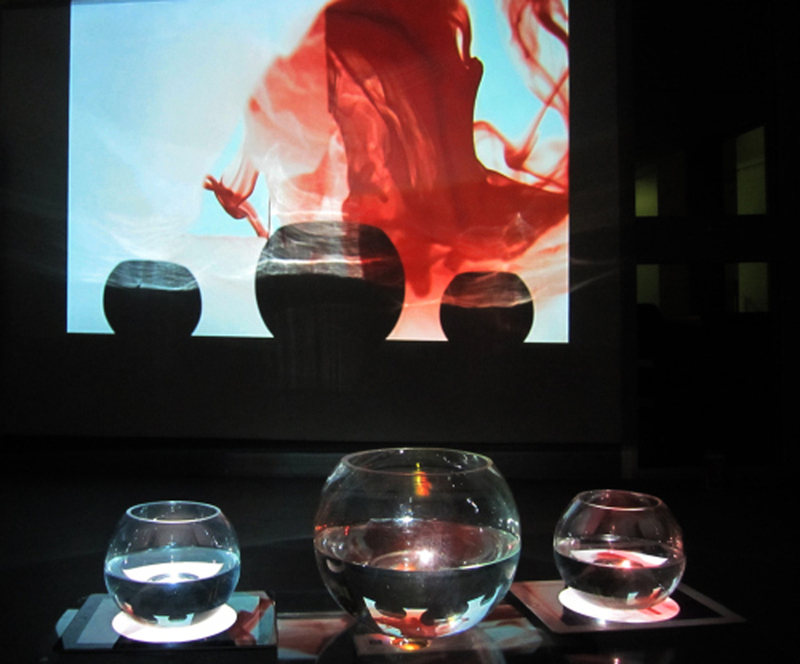 Multiple High Definition Digital Video Installation with Glass and Water. Fragility: Femininity 2012. Installation Detail Queensland College of Art, Brisbane, Australia. 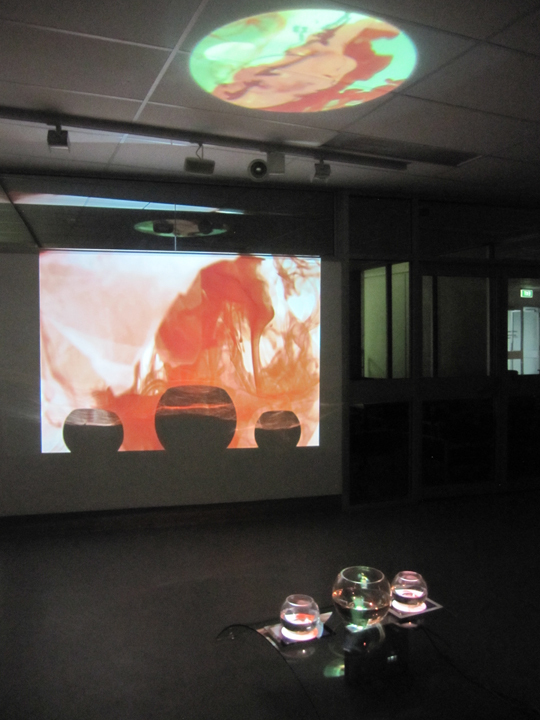 Multiple High Definition Digital Video Installation with Glass and Water. 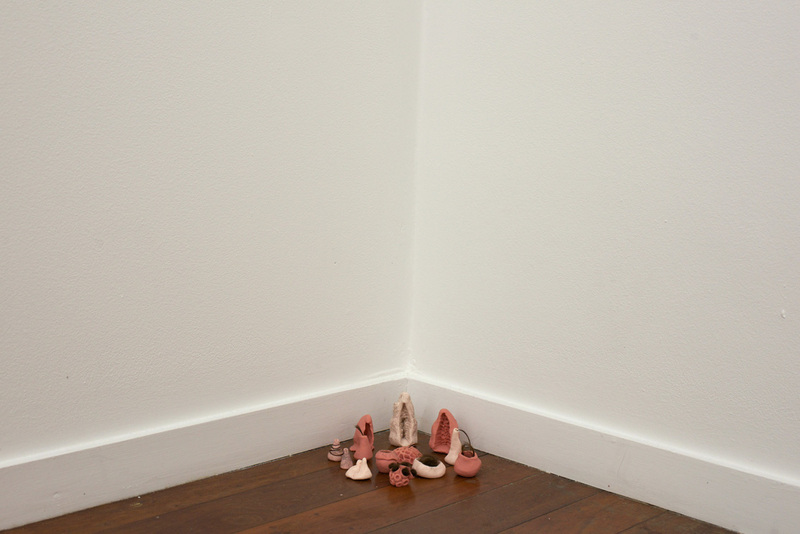 Fragility: Femininity 2012. Video Except. Multiple High Definition Digital Video Installation with Glass and Water. This new media installation work utilizes basic visual metaphors in order to provide an array of interpretations. The slow pace and subtle transitions of the videos were employed to create a calming and emotionally centered response. The glass and water allude to themes of fragility and vulnerability while the monochromatic colour scheme – featuring red – provides a broad range of understandings, suggesting connections to the human body, life and death and femininity. Influenced heavily by the work of Ann Hamilton, this work connects to the human body, from the model in the imagery, to the circular crop corresponding to the shape of the eye. There is a connection shared between the viewer and the viewed as an audience member intrudes on these intimate moments from a viewing point of elevated empowerment. 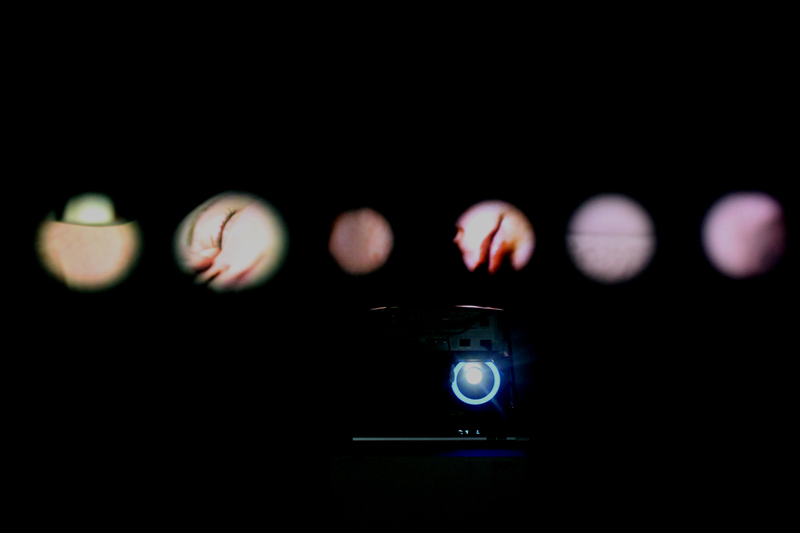 Constructed as a triptych, the video works featured in the fish bowls are somewhat narrative in nature. They are contained and cropped within the subtle and delicate aspects of the installation, inviting the viewer to engage with the work on a close and intimate level. The larger aspects of the work, such as the wall and roof projections are more abstract in nature. Rather than giving a narrative for the viewer to respond to, they invite the audience to create their own. There are aspects of tension within the work as the bowls of water teeter, balancing on the iPad’s and the curved surface. This balancing act mirrors the audience’s interaction with the work and corresponds to the tension created between venerable subject and empowered viewer. Songs of Innocence and Experience 2011. Digitally Manipulated Giclee Print on Epson Photo Paper Premium Gloss. Series of Twelve 42cm x 29.7cm [59.8cm x 133.3cm Installed] Ed of 3. Songs of Innocence and Experience is an exploration of situations that have the ability to dictate who we become. Referencing pop culture icons such as Lady Gaga and Madonna, it reflects on the saturating effect that society’s ideals of beauty have on our self-perception. It’s incorporation of prominent Christian symbolism connects to the work of Lady Gaga as well as poet and artist William Blake, questioning the impact that being raised in organized religion can have on who we become. This work documents a progression from childhood to adolescence as one questions and reflects on what is true. Yin and Yang 2011. High Definition Digitally Manipulated Video. 1920 x 1080 pxl [2:20 looped]. Inspired by the traditional Chinese philosophy, Yin and Yang explores the balance that exists in all things. With a particular focus on nature, the motion of chalk and charcoal represent the living, breathing and delicate nature of the environment. It illustrates how easily nature can be disrupted but also its resilience and ability to heal.